Geeks Fish Too: Vacation in North East Texas! 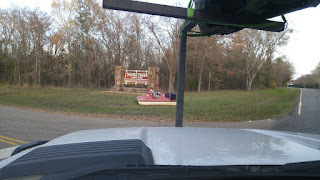 Vacation in North East Texas! Everyone needs some time off once in a while. We haven't had an extended vacation for a while now. We've had several 4 day weekends where we've taken the RV out to the hill country, but this is different. We were parked in the same place for nearly 10 days! After being all pumped to go fishing in NE Texas, it was rather disappointing when right after we arrived at Purtis Creek State Park, a storm blew in. And I mean BLEW IN. We came in on Friday and on Saturday the wind was blowing around 20-25mph. It was 70 though and I knew that by the end of the day it was supposed to storm, so we went fishing. I took off first from the pier area and immediately knew this was going to be exciting because I could barely control my boat. I almost turned around and gave up. But I kept thinking that there had to be some calm water back in the cove. However, as I started away from the pier the wind caught me and I realized that taking my hands off the paddle for more than a second was a problem. The waves were big enough to capsize smaller kayaks. I was very thankful for my Jackson Big Tuna at that point because even sideways in the waves I didn't feel in any danger. 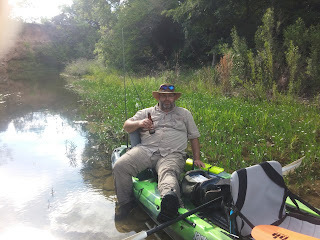 Of course, many times in rapids on Texas rivers helped me with the fear problem. The question however was Sarah. I started to doubt whether she could handle it or not. But as she came away from the dock I realized that the bow of her boat was actually higher than mine which meant she ultimately stayed dryer than I did! Every now and then I'd have a wave come over the from of my boat that would cover the bow completely. Was crazy! In reality, the biggest danger from the wind was not capsizing because of the waves - at least not entirely. The area of the lake we were in was full of submerged timber. It was nice to grab a trunk here and there to rest from paddling, but the trunks hidden under the water - that was another story. I greatly feared no seeing a stump beneath the waves and then end up landing on it while the water dropped. This would inevitably mean the boat would tip over suddenly. But other than one minor time, we were able to avoid the underwater stumps. We finally made it down into the cove where it was protected from the wind and the water was surprisingly calm. I actually broke out my purple Booyah buzz bait because I saw surface bait all around the cove. We weren't very successful but I did manage to catch one small bass. That was the consolation prize for the battle we had getting back out of the cove. It was a pretty crazy fight and took us nearly 45 minutes. The same trip a few days later took us 10 minutes. This was basically the highlight of the trip. The rest of the trip was spent waiting for the water to go back down because we had 4 inches of rain Saturday night. Funny part was that Sarah caught two fish, one legal fish being right after the flood where a wet weather creek flowed into the lake, and the other small bass being several days later at Lake Athens on a cold day. The trip in it's entirety wasn't too bad. I had one day in the middle where I had to go work at a site up in Dallas but that "one day" made the whole trip cost that much less since my company paid my expenses for part of our trip. In fact the mileage alone nearly paid for all of our gas for the trip. Can't complain about that! The lesson we learned through this is not to plan vacation in the winter time in Texas. It's likely to be ruined by bad weather. It probably would have been more productive to go down to the coast and do some saltwater fishing down in South Texas . I'm sure the fish would have been biting much better!